This optical illusion costume is a variation of the baby in the high chair. 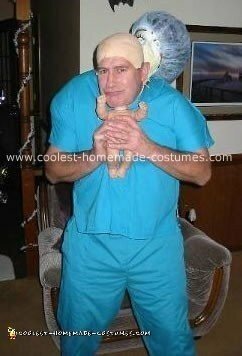 It’s a nurse holding a newborn which is me. On the back of the scrubs is stenciled “Labor and Delivery”. Where did you get the hats and how did you get the heads to stay on?Thanks! !